The long wait is over: Kyle Lohse has officially signed a three-year, $33MM contract with the Brewers that includes an additional $1MM in performance bonuses. The Boras Corporation client passed his physical this afternoon and will join his team for the remainder of Spring Training. "This signing makes us a better club today than we were yesterday," said general manager Doug Melvin in a team-issued press release that confirmed the signing. The Brewers will forfeit the 17th overall pick and the accompanying slot money in the June draft, while the Cardinals will gain the 28th overall pick. Lohse will reportedly earn just $4MM in 2013, followed by salaries of $11MM in 2014-15. The contract contains $7MM worth of deferred money that will be paid out from 2016-18. Lohse, 34, seemed en route to a large contract after posting a 2.86 ERA, 6.1 K/9, 1.6 BB/9, 0.81 HR/9, and 40.5% groundball rate in 211 regular season innings for the Cardinals in 2012, and pitching well the year prior. Turning down the Cardinals' one-year, $13.3MM qualifying offer seemed the right call in November for a player I considered the 10th best free agent available. 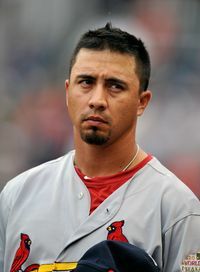 However, partially because of the draft pick compensation issue, Lohse languished on the market nearly until Opening Day. Agent Scott Boras, whose contract demands were the other major factor in Lohse's wait, told ESPN's Jerry Crasnick in January, "It doesn't really matter what time dinner is when you're the steak." Lohse had been throwing simulated games in Arizona, but it's unclear when he'll be Major League-ready. Having traded Zack Greinke midseason and lost Shaun Marcum to free agency, the Brewers were hurting for a veteran rotation presence behind Yovani Gallardo. It seems likely that Boras made his appeal at the Brewers' ownership level, convincing Mark Attanasio to make the win-now signing and give up the draft pick. The Rangers were the runner-up for Lohse, though they never made an official offer, tweets Bob Nightengale of USA Today. Jon Heyman of CBS Sports was the first to report the agreement (Twitter link). USA Today's Bob Nightengale tweeted the financial details, while ESPN's Jerry Crasnick reported the details on Lohses's incentives (via Twitter). MLB.com's Adam McCalvy reported the breakdown of Lohse's salary and deferred money (on Twitter).